mack, smack-smack. The basketball players dribbled the big orange ball down the court, looking for a chance to score a basket. Danny held his breath, squeezing his hands together as he watched the ball arch upward, then down, swishing through the net. Jumping to his feet, Danny cheered and clapped with the rest of the crowd. His team had scored. They were ahead at last. Soon Danny would be able to play. A few more points; a few more minutes. Then it would be his turn to get in the game. Danny knew he wasn’t the best player on the team. But oh how he wanted to be. 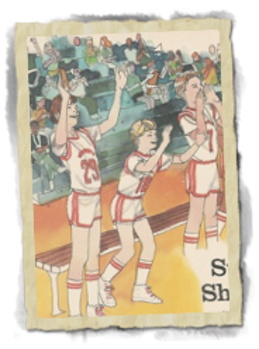 Thinking about it made his skin tingle -- the hush of the crowd as he paused to shoot, the building excitement as the ball found the rim, and looped into the net for the winning score, the wild cheering. If only. . .if only. . .
Danny shook his head, clearing away his daydream. He needed to be alert when the coach called on him, not off somewhere else dreaming the impossible. Shot. But theirs weren’t names to grow out of. They had names that fit them like well-worn shoes. Tagging Juggler, Danny took his spot in the lineup. Today would be different, he told himself.Today he’d be so good, no, he’d be so great, that his size wouldn’t matter. A hand-off from Sure-Shot Nichols got Danny into the action fast. He pivoted left and then charged right, throwing his guard off balance and setting up a pass back to Sure-Shot. Danny grinned. He wasn’t tall, but he was quick, he told himself, like a distant flash of lightning: gone before you knew it was there. Settling into the pace of the game, Danny looked for openings where he could show his stuff, but the game seemed to take place above and beyond his reach. Rebounds were grabbed by taller players. Long passes were intercepted. His shots fell short of their mark. Eying the scoreboard, Danny brushed the sweat from his forehead. The clock read 2:58, and the score was tied. How had that happened? The coach only let him play when they were safely ahead. Why didn’t he send in a taller player? A foul stopped play, giving Danny a needed moment to think. being small, but that . . .” Danny didn’t need to finish. He had the answer. As the others reached for a missed jump shot, Danny held back, waiting for his moment. When it came, he exploded into action. Making himself as small as possible, Danny snatched the dribbled ball from under his opponent. It was a snap. The other player hadn’t seen Danny coming. He was too tall. Now Danny was playing at his level, one the other team wasn’t used to. Danny limited himself to quick moves, short passes. He didn’t pass high. He passed low, setting up his teammates for baskets. The score swung back and forth. 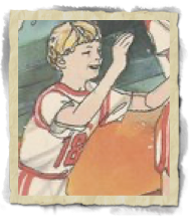 As the final seconds ticked off the clock, Danny spun left toward the basket, keeping the ball close to his chest. 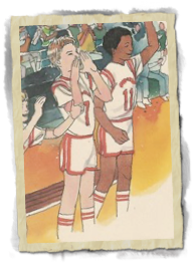 Now was the time for him to score the winning basket, to hear the crowd cheer, to feel the glory. A guard loomed above him, daring Danny to shoot. Just as the guard jumped, Danny saw his opening. But instead of shooting, he bounce passed the ball to Sure-Shot right between the guard’s legs. Sure-Shot proved true to his name. He put the ball up and in as the buzzer sounded. His basket had won the game. Danny face flushed with pleasure. He was a shrimp all right. A super shrimp.